This is a quick post to lay out the plan for a retro project that has recently struck me and to which I have committed fully. It hit me when I heard that CapaMod was updated in 2008. And all the hardware was black in color, in the spirit of NeXT. I ran this system under NEXTSTEP for about nine months before I gave in to the lack of mainstream apps under NEXTSTEP and the desire to load up the capacious HD with DOS demos and games and, yes, Windows 3.1. Once I went this route, I replaced the Wingine (take a moment to read about that technology) with a Hercules Dynamite Power VLB video card based on the Tseng Labs ET4000/W32p chipset, one of the very fastest in terms of DOS graphics performance. The Pro Audio Spectrum 16, I replaced with a Gravis Ultrasound (or GUS), an extremely powerful (for the time) wavetable audio card that supported 1MB on-board sample RAM and playback on up to 32 hardware channels, using little more than 0% CPU resources. It was one hell of a machine for early ’90s DOS scenedemos and games. 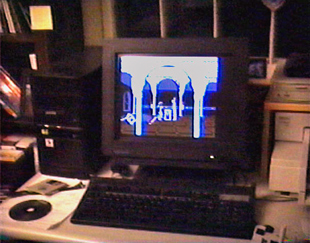 In time (1996), I replaced the motherboard in that tower with an ASUS PVI-486SP3 in order to jump to an AMD 486DX4 120. That was a nice boost, but I soon took it further to an AMD 5×86 133 overclocked to 160MHz, which is pretty much equal in performance to a Pentium 90. Coming from an Amiga background and being a fan of the demoscene, I was a big SoundTracker MOD (and similar formats) fan back then. The GUS was one of the best sound cards out there for MOD playback and the most accurate player available for it was CapaMod. 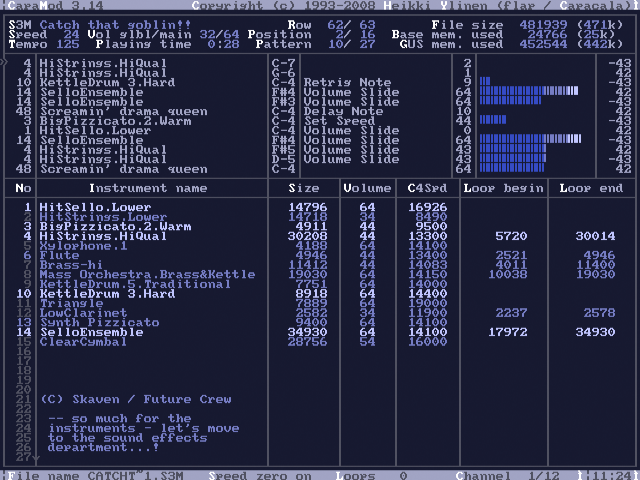 CapaMod or CMOD [ download ] is a GUS-only player that was originally released in 1994 by Heikki Ylinen (“flap”) of Capacala and maintained until 1996. Then, out of nowhere, an update came in 2008 with an indication from flap that it’s the last update the player will see. (But he’s said that before…) I spent weeks in front of that app, cranking tunes through my Bose RoomMates. So, I was tweeting about the GUS for some reason recently, when someone pointed out that CapaMod had been “recently” updated. So, I fired it up in Boxer (DOSBox) and played a few MODs. They played, but with a bit of stuttering. DOSBox has GUS emulation (hat tip), but it’s not perfectly smooth, at least not on my not-so-meager mid-2011 iMac (quad-core Core i7 3.4GHz with 16GB RAM). This got me to thinking about how great it would be to once again listen to those tunes played back at high quality on a machine that used custom hardware to overcome CPU limitations — a machine built around an architecture where hardware sound channels and DMA audio matter, distant from the computers of today, where 200 “channels” could be mixed into just two hardware channels in software, hardly taxing the multi-core CPU running at many thousands of megahertz. The thought of again seeing all aspects of such a system pushed to its limits by the many incredible PC scenedemos of the early to mid ’90s began to sound pretty great. Not to mention classic DOS games played on real metal. In short, I feel things were more fun when exceptional MOD playback and demo performance was a true feat, rather than a cakewalk to the host hardware. 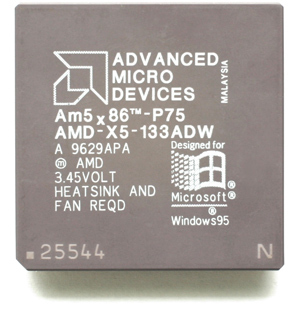 This is a be a big part of my attraction to vintage Amiga hardware, and retro systems in general. And, so, I am setting out to put together a system very close to the one which I’ve described, that I began enjoying nearly 20 years ago. I still have my trusty GUS soundcard and the DPT PM2021 SCSI controller — they’ll be part of the system. It’s off to find the right motherboard, graphics card (anyone have a Hercules Dynamite Power VLB they want to part with? ), CPU, and case / PSU. UPDATE: I forgot to mention, I’m getting lots of good info for this project from an incredible set of forums I only recently discovered: VOGONS (Very Old Games On New Systems). This entry was posted in DOS / Win PC. Bookmark the permalink. If you are successful and don’t post a lavish amount of high-quality videos, I’m going to personally fly up there and beat you over the head with a stuffed three-legged albino platypus. Was using ‘cakewalk’ in that article an accident or a subtle pun? Wow. It was subconscious, surely. Hah.